The mycological experimentation has begun! I planted a 4’ x 8’ bed of oyster mushrooms (Pleurotus ostreatus), from an inoculation kit I ordered through 100th Monkey Mushroom Farm. [Check out their website, they have good resources, especially if you have (or work) with kids: www.100thmonkeymushrooms.com] There are many places to purchase mushroom inoculants and kits of various species and difficulty levels. Do your research and find something that works for you. I chose oyster mushrooms because they grow quickly. I’m interested in how they can be used to remediate soil (more on this later) – oh, and I like how they taste when sautéed in butter! Here are a few photos of the steps I took in setting up the bed. Step One: Identify a spot to grow. Think about where you generally find mushrooms… most likely in decaying matter in the damp, dank forest. Many species of mushrooms, including the oyster mushrooms I am growing, like to be in a moist, warm, and shaded area. I began observing different areas around the grounds for how much sun they received throughout the day and found a spot on KNOX’s site that is primarily shaded. Step Two: Choose your method of growing. The kit I purchased had options for growing the mushrooms in either pots/containers, in a raised bed or in-ground garden space, or in harvested logs of hard wood. I chose the raised bed because it was the most available to me and would be a good medium for demonstration. For the actual structure, I repurposed an old 4’ x 8’ Douglas Fir raised bed on-site. I was also given options of substrate including coffee grounds, straw, and wood chips. I chose to use straw, again, because it was readily available to me in the quantity I needed. Step Three: Prepare your space. Think about how you will access your growing mushrooms. Do you need to leave a pathway? Can a hose reach the area? 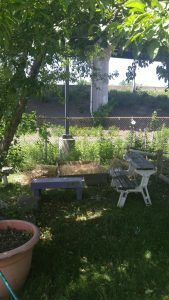 I positioned my raised bed with a 3-foot-wide path on three sides, with one of the 4’ sides up against a fence. Because I am using a raised bed space, I needed to set up a barrier between the ground and the substrate. This helps to prevent weeds and grass and other living things in the ground from contaminating your growing space. 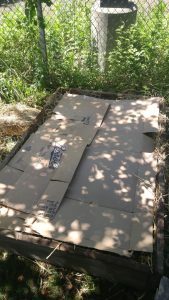 I used salvaged cardboard (thanks Farm & Grounds Manager Sven!) to cover the space inside my bed. Step Four: Add substrate and inoculate. 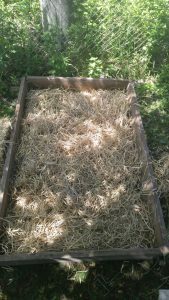 Place a layer of straw about 3 inches thick on top of the cardboard that is lining the bottom of the raised bed. Break up half of your inoculant into a grainy powder. Sprinkle evenly over the bottom straw layer. 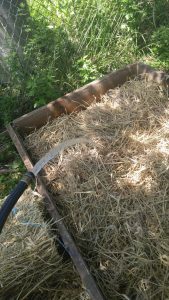 Place another 3-inch-thick layer of straw over the inoculant. Break up and sprinkle the other half of the inoculant over the straw. 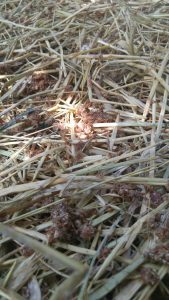 Place a final 3-inch-thick layer of straw over the second inoculant layer. Cover the bed with a layer of cardboard. Step Five: Maintain and watch grow. You’ll want to water your mushroom bed every other day to keep it moist. Keep the bed covered with cardboard until you begin to see mushrooms emerging from the straw. 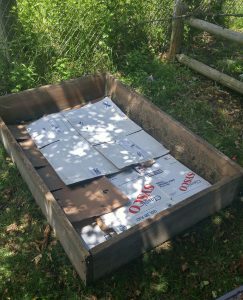 At this time, remove the top cardboard layer and decrease watering to once a week (twice if it’s really hot). Oyster mushrooms do not particularly enjoy high temperatures. The shade should help with this, but I may decide to inoculate another bed come late August, to compare growing in different seasons. When foraging for wild mushrooms, you will generally find most oysters after the first rain of autumn. The final step is to harvest, but I’ll save that for my next post. If you’re reading this and thinking, ‘Thanks but no thanks, I really have no interest in growing mushrooms,’ I’ll leave you with some fascinating research carried out by Suzanne Simard, a forest ecologist at the University of British Columbia. Simard discovered that in a forest ecosystem, tree roots are all connected by mycorrhizal fungi that have a mutually beneficial relationship with the trees. The mycelium (the vegetative body1 of a fungus) can digest most things it encounters in the soil, breaking down rocks into their component minerals. They then make these nutrients available to the trees through the roots. Roots, being able to absorb but not digest, rely on the mycelium for these essential minerals. The mycelium attached to the tree roots then absorb glucose (sugar) produced in the tree leaves through photosynthesis. Fungi do not have chloroplasts and cannot carry out photosynthesis, making glucose difficult to find. As the mycelium transport glucose to the whole of its growing body, the glucose is also carried between tree roots, allowing, say, a mother tree to transport nutrients to its daughter sapling. Communication at its best—everyone gets what they need. Still not convinced? Research by Paul Stamets has shown that many types of mushrooms, oyster mushrooms included, are incredibly efficient at breaking down molecules of petroleum, PCB’s, and other pollutants. Mycoremediation (bioremediation through mushrooms) could be crucial in restoring life to land ravaged by toxic waste, an increasing problem today. I told you I’d loop back around to soil health! A vegetative body, or thallus, is the undifferentiated tissue of a non-moving, multicellular organism. In the Kingdom Fungi, tissue is not separated into distinct organs, with highly specialized cells for each structure (think about the heart having vascular tissue.) There may be certain identifiable areas on the thallus that serve clear and coordinated purposes, but they are ultimately anatomically undifferentiated.